The GL-9007 (20074) Golight Radioray from Larson Electronics is a 36 Watt LED motorized spotlight that operates with dual handheld and dash wireless remote controls. This particular model is available in white and is permanently mounted. It produces a wide spot beam with an effective working beam of 900 feet long by 70 feet wide. The GL-9007 (20074) Golight Radioray is designed for use in all weather conditions and produces 2,500 lumen of intense light output. These units feature remote control operation that allows users to rotate the light 370 degrees with a hard stop and to adjust vertical tilt through 135 degrees. Remote operation is provided by dual wireless remote controllers that operates over a radio frequency of 433 MHz. This spotlight includes one handheld wireless remote and one dash mount wireless remote. These remotes includes an internal 12 volt battery rated at 1 year of operation and a single red LED to indicate remote control activity. Each remote controller has a range of up to 100 feet and will operate through walls, within structures, and in vehicles. The remotes are constructed of polycarbonate with rubber push pad buttons for weatherproof durability and can be user programmed to operate one or several lights simultaneously. Dash Mount Remote: This particular model also includes a wireless dash mount remote. This remote control is considered dash mounted because once the rubber cover is removed, the unit can be attached to any mounting surface by fastening 4 screws through the holes shown below. The rubber cover is replaced, providing weather resistant protection to the internal electronics. Operators can also attach velcro to the back side of the remote, allowing the dash mount remote to be quickly removed and work as a handheld remote. The remote features dual speed control of the motorized rotation and tilt. This is an ideal feature for remote operation conditions where the operator cannot see the angle of the beam from the driver`s seat.This dash mounted remote control features an on/off button, a fast/slow selector and 4 directional buttons. 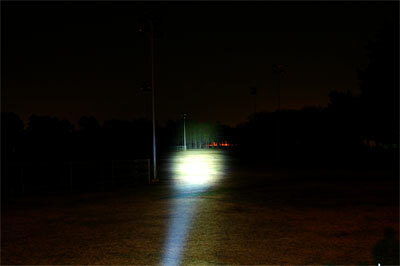 The motorized remote control spotlight will move in a direction as long as the button is depressed. Once released, the remote control spotlight will hold that position. These dash mount wireless remotes measure 4.38 inches long by 2.65 inches wide by 1/2 inch thick. Durability: The GL-9007 Golight Radioray is designed for hunting and demanding outdoor use with a weather resistant housing constructed of high quality ASA Luran thermoplastic that is heat resistant, impact resistant, UV resistant and able to withstand rugged use and abusive conditions. This particular Golight is white in color, making it ideal for docks and buildings where an attractive appearance is desired. Remote movement of this spotlight is provided by an automotive grade internal motor, gear, and transmission assembly that is constructed of lexan, brass, and stainless steel to provide rust and corrosion resistance as well as long life and reliable operation. Mounting: The light is permanently mounted to a flat surface with four screws. The screws are included. Power: This light operates with 12 volts DC and draws 3 amps, making it ideal for vehicles, boats, ATVs, and similar sources of 12 volt direct current. On this particular model, the light ends in a 1 foot pigtail. Operator must provide wiring from the Golight to the power supply. 16 AWG is recommended. 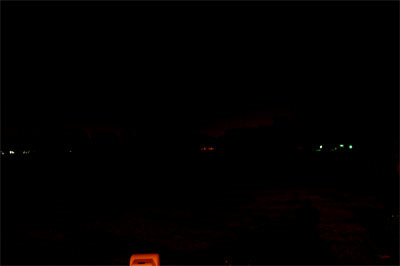 This photo shows a large field at a park with no illumination, save the distant street lights behind. This unit shows the LED Golight being used to spot light the distant trees, located approx. 800` from the unit.